Winefeast, sponsored by Community First Credit Union, will be held again this year at the Best Western Premier Waterfront Convention Center on Saturday, April 6th. WineFeast reservations include both the Cellar Select dinner (sponsored by CR Meyer) and the private post dinner Night Cap event (sponsored by Bergstrom Automotive). Cellar Select (sponsored by the Best Western Premier Waterfront Hotel) is a relaxing five course dinner and wine pairing (sponsored by Baker Tilly) experience which begins with a champagne reception (sponsored by PACUR) promptly at 5:00 p.m.
Dinner will feature five mouth-watering courses including a salad provided by TJ’s Harbor Restaurant, an appetizer provided by PRIMO, soup provided by Granary Brew Pub, an entrée provided by the Best Western Premier Waterfront Hotel and dessert provided by Tamara’s the Cake Guru. 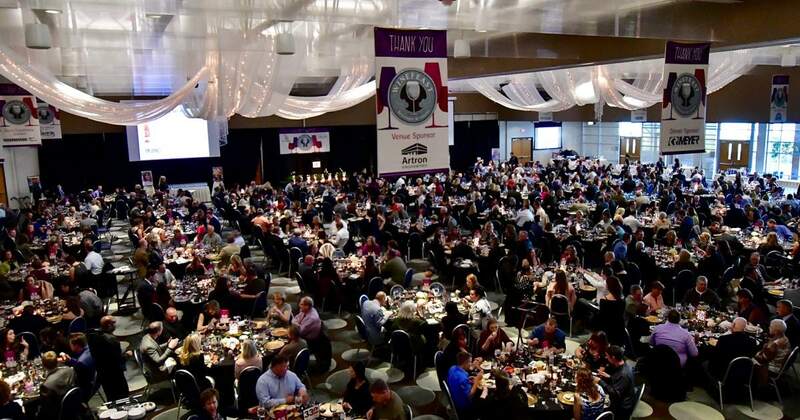 During dinner, guests will enjoy an exciting live auction (sponsored by First Weber Foundation) and a short program including a mission moment video (sponsored by MARCO Promos) and a story from our newly named 2019 Youth of the Year about the impact the Boys & Girls Club has on Oshkosh youth and families and how Great Futures Start at the Club (sponsored by Oshkosh Corporation). Night Cap is exclusively open to Cellar Select guests only following Cellar Select at 8:00 p.m. and will feature the smooth jazz sounds of the Mike Kubicki Quartet (sponsored by Menasha Corporation Foundation) and the opportunity to sample wine, domestic and imported brews and delicious light appetizers from a number of your favorite local restaurants. Guests will receive a complimentary Riedel red wine glass (sponsored by Miron Construction). There is also a silent auction (sponsored by Verve, a Credit Union) with over 50 unique items. Plus, wine, popcorn and chocolate (Hughes’ Home Maid Chocolates) raffle opportunities. All proceeds from WineFeast go to the Boys & Girls Club of Oshkosh and directly benefit families and children in our community who most need the services the Club provides. This includes healthy meals and snacks, homework help, basic needs support, one on one mentoring and quality programming that focuses on STEM, staying active, and building character and leadership skills. WineFeast reservations cost $125 per person and tables of eight are available for $1,000. Reservations include the Cellar Select dinner and a full-access pass to Night Cap. Tables are selling fast and there are only a few left. Make your reservations today! To purchase reservations for WineFeast, please visit the Boys & Girls Club online. To learn about sponsorship or volunteer opportunities or for other questions, contact Director of Advancement Tracy Ogden at (920) 233-1414, ext. 116 or tracyo@bgcosh.org. WineFeast is in need of both silent and live auction items. Donating auction items gives businesses and individuals the opportunity to display their product and get free advertising. For more information on donating an auction item, please contact WineFeast Auction Coordinator Heather Holly-Pinnow at WineFeastAuction@bgcosh.org.